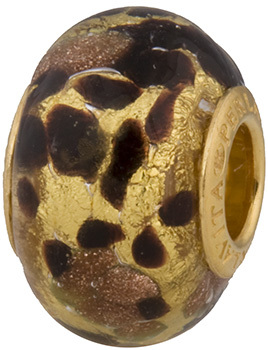 Aventurina and Spashes of Chocolate over 24kt Gold foil in a large hole bead. Rondell approximately 15x10mm with a 4.7mm Vermeil (Gold Plate over Sterling Silver) Insert. Fits all popular size bracelets. Authentic Murano Glass and Italian Silver.